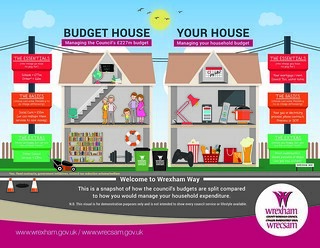 In September and October 2014, Wrexham County Borough Council asked the public of Wrexham to take part in the ‘Difficult Decisions’ consultation, to inform the decisions we had to make in order to save more than £11 million from our budget for 2015-2016. The consultation involved a survey, and 2 consultation events which were attended by: town and community councillors, the tenants’ forum, Wrexham Over 50s Forum, the Equality Impact Assessment group (diversity forum), members of Wrexham’s citizens panel, and representatives from the Senedd yr Ifanc. Over a thousand people took part in the consultation in all, and we would like to thank all those people and groups who took part.